The National Adventure Sports Show (NASS) which takes place on 6th-8th July at the Royal Bath and West Showground, Shepton Mallet will be travelling the country in the lead up to the festival bringing cash for tricks shake jam sessions to five spots in the UK. Relentless Energy Drink will be pushing the challenges offering up £500 per stop for ‘tricks of the day’ as part of the Relentless Energy Drink Super Series Tour. Add that to Santa Cruz and Indy goodies and you’ll be swimming in product. Just show up on the day to enter. There will be pro and amateur categories at each stop and will be judged by pro’s from Indy, Santa Cruz and Relentless Energy Drink. The tour hits Bristol at the infamous Dean Lane Skate Park on Sat 9th June with Amateurs at 2pm, followed by the Pro’s at 3:30pm. It’s free to enter and there is a £500 prize purse. 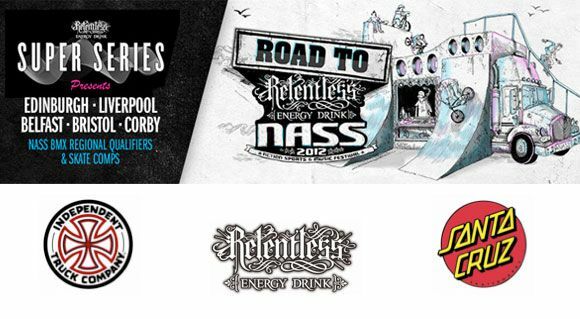 For those of you who prefer two wheels instead of a board, the BMX tour hits Motion, Bristol on the same afternoon as the Road to ‘Relentless Energy Drink NASS’ BMX Qualifiers Skate Competition rolls into the city at the same time. Their is a prize purse of £1,500 and it costs £10 to enter.